These are the weekly light novel sales charts for 2016, via myanimelist news, continued from the 2015 post. If you want more recent data, there are other places where charts are available (e.g. the mal news forum I get them from). These are the weekly light novel sales charts for the first four months in 2015, via myanimelist news, continued from the 2014 post. I’ll be doing one of these updates every 4 months; if you want more recent data, there are other places where charts are available (e.g. the mal news forum I get them from). These are the weekly light novel sales charts for the first four months in 2014, via myanimelist news, continued from the 2013 post. I’ll be doing one of these updates every 4 months; if you want more recent data, there’s plenty of places where charts are available (eg. ann, the mal news forum I get them from). Edit: Added data through August 2014. Edit 2: Added data through December 2014. Despite the fact that both get released in compiled volumes costing somewhere between 400 and 1000 yen a few times a year, the market for manga differs in many ways from the market for light novels. For one thing, it’s a much smaller scale market; the most popular light novels sell hundreds of thousands of copies immediately after their release, rather the millions that One Piece/Fairy Tail/Attack on Titan bring in. Too, light novel adaptations tend to succeed much more as a function of their initial popularity than manga does. To get an in-depth look at how anime adaptations of light novels have impacted the source material, I’ve plotted the sales for their first two weeks of solicitation over time, with the airdate of the anime superimposed. See this doc for the raw data, and compare the 2011 data for manga adaptations. Note: I plot the two-week totals, rather than the one-week total, because even the average the first week total is vulnerable to a series that comes out on the last of the Oricon tracking period and having its sales numbers hamstrung. Kore wa Zombie Desu Ka had 4 volumes in a row come out on the last day of the week, obscuring a very real anime-fueled boost in sales. 1. 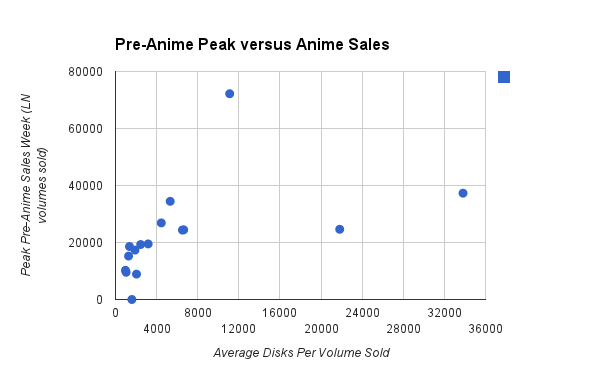 No LN series that had at least one week where a volume sold 20,000 copies in that week (disregarding cumulative totals) that went on to sell less than 4000 disks per volume. Only one (Mayo Chiki) sold less than 5000. 2. No LN series without at least one week where a volume sold 20,000 copies sold more than 4000 disks per volume. Only one (Kore wa Zombie Desu Ka?) sold over 3000. Weekly Oricon rankings of Light Novels, continued from the 2012 post. Based on just what I saw copy-pasting these lists together, there’s a pretty favorable case to be made that Mahouka Kouko no Rettousai will sell more than anything else in 2014. More on that when I actually get around to using these for the purpose I compiled them for. Weekly Oricon rankings of Light Novels, continued from the 2011 post. Weekly LN rankings from 2011, continued from the 2010 post. This is where the sample starts getting interesting for the purpose of determining the effects of LN sales on the popularity of an anime (and subsequent effects of the anime’s popularity on LN sales), since we have a solid baseline or thresholds for comparison from previous years for everything that got an adaptation this year. Same as for 2009, but for 2010. This year sees multiple series (BakaTest, Durarara, and OreImo) scoring huge sales resurgences soon after their anime aired, taking up 5+ spaces on the weekly charts with old volumes. It helps to have a chart threshold that’s below 10k. This phenomenon also happens on the manga charts, but far less frequently and to a much lesser degree for series not named Blue Exorcist or Attack on Titan. Oh, and a quick fyi; the reason why there are different list sizes for different weeks is because these are taken from the LNs that charted on the overall novel rankings, and their numbers can vary by week.